Swiftlet Farming: Million Dollars A Year Income Potential. : Your Read But Your Never Applied !!! I was given the opportunity to inspect this BH in N9 and I was a bit not very pleased with the owner. He DIY the BH and keep saying that he have been reading my blog for almost 2 years now. As far as I can see inside and outside the BH he did very little with all the information, data and descriptions given. I pointed to him some very glaring mistakes that I would punish my student for being so terrible. 1) He wrongly placed the hexagonal tweeter above his monkey house. I keep telling where the hexagonal should be installed and it must be as closed as possible to the main entrance hole. The best is just above the middle of the window frame. This owner put it to the side where it was convenient. 2) The hexagonal tweeter must not be too high or too low. This BH was with a hexagonal about 7-8 feet above the monkey house roof. This is not the way I described in my blog. I think he must be reading a wrong blog and not mine. 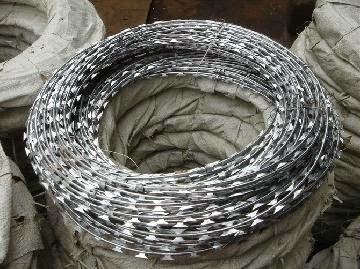 3) He was so angry with those owls entering his BH he quickly installed those barb wires that are suitable for Guantamo prison. The barb wires were laced with those sharp blades all over the place. I don't think this was a very good decision and I have never recommended this hash method. 4) At the main entrance hole he enveloped his external sound tweeters inside those razor blades barb wires. 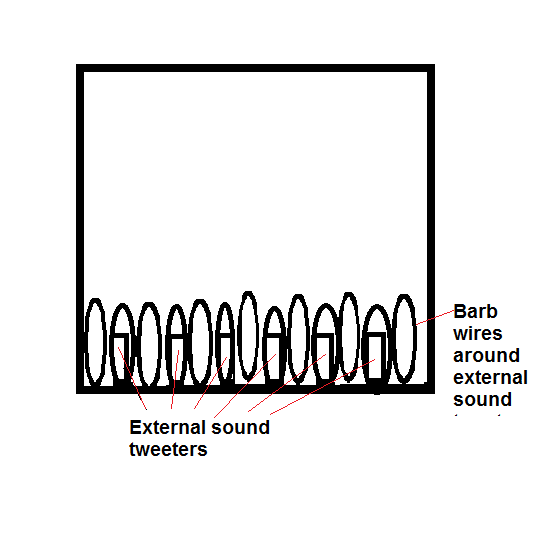 See this sketch and can you imagine what happen when those poor birds wanted to pack at the tweeters? 5) Internally only a few ideas that belong to me was installed and many were not done exactly to what I have written. Good example is that he installed those cluster tweeters but not very well done. 6) There was no gadgets to lure those birds to enter and quickly stay. Good example not a single fake nest inside this 100'X25'X3 stories high BH. A very poor planned BH. 7) The amplifiers were not properly set and both sounds were very noisy and not correct. All in all I was a bit upset when he claimed that he has been reading my blog for almost two years but nothing seems to have entered his brain. So those of you who read my blog and never apply those ideas given please be careful not to upset me. A messy BH with very little result if you do not follow those interesting ideas that I have described in my blog.